Once When You Were Small . . .
Once when you were small you dreamed of big things. Now that you are old you think of small things. What’s wrong with this picture. Worry and Creativity . . .
It’s time to change it up and start dreaming bigger than life. Time to reach for the stars. It’s time to have faith in love, fate, and me. It’s time to reclaim my spontaneity so that I can pivot on a dime and once again claim my destiny. Dreaming is good big or small. 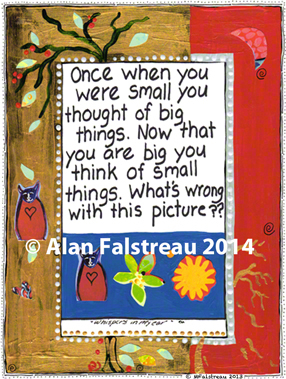 I know what you are implying but small tasks can be as important as big ones sometimes.